According to reports, Manchester City director of football Txiki Begiristain has met with Pep Guardiola in Barcelona as rumours of the coach’s arrival in the Premier League continue to swirl. 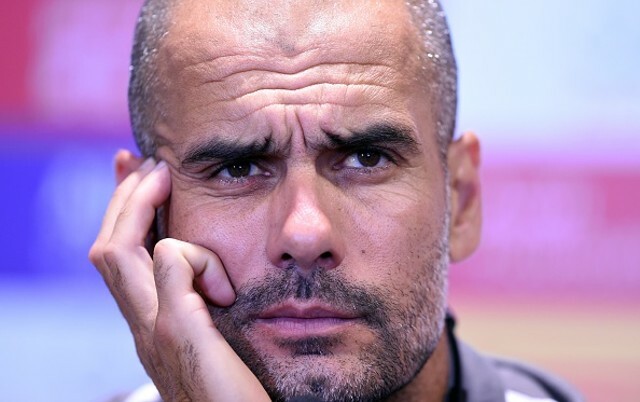 Guardiola confirmed earlier this month that he will be leaving Bayern Munich at the end of this season, although while the Bavarian giants have confirmed that Carlo Ancelotti will be replacing the Spanish manager, the ex-Barcelona coach’s future has not yet been decided [ESPN]. Guardiola is one of the game’s truly elite managers, having won five league titles in Spain and Germany, and having lifted the Champions League twice—both during his celebrated stint at the Camp Nou. He is a three-time Club World Cup champion, with the last of these global titles coming during his time in Germany. As such, Chelsea, Manchester United and Manchester City have been linked with the coach [Express], while French giants Paris Saint-Germain have also been tipped for a move for the decorated manager [Le 10 Sport]. The Red Devils may be considering Guardiola as a potential replacement for Louis van Gaal, whose miserable spell in charge at Old Trafford arguably reached a new nadir with defeat to Stoke City on Boxing Day. However, according to the Mirror, City are edging ahead in the race for the legendary coach, with Begiristain—who worked with Guardiola at Barcelona—understood to have met with the manager over the Christmas break. While there is a chance the meeting was merely a festive reunion between old friends, the tabloid speculate that their get-together was evidence that Manuel Pellegrini is “almost certain to leave at the end of the season”, with Guardiola looking primed to take over at Eastlands.